Mannequin Records starts a series of re-presses dedicated to the legendary Nocturnal Emissions, one of the best kept secrets of the industrial genre since the 1970s. Led by Nigel Ayers and Caroline K, the band was one of the first to use tape cutting, avant-garde art, and underground video works to create a stage experience that was being cultivated by like-minded artists like Throbbing Gristle, SPK, and Cabaret Voltaire. Originally self-released in 1988 on Earthly Delights, Spiritflesh is a masterpiece and a major reference for the early drone/dark ambient minds. 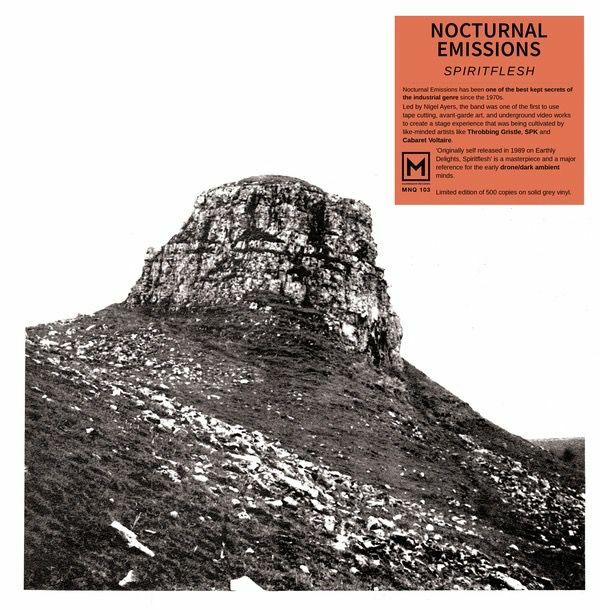 By the time the album came out, Nocturnal Emissions had already produced several albums of electronic music which varied from noisy to funky. Displaying his usual perversity, Nigel chose to ditch electronic dance music immediately before the acid house revolution and produce a series of utterly compelling atmospheric albums which are often referred to these days as being "ambient industrial". Spiritflesh was the first offering by the new shape of Nocturnal Emissions. Essential.